Its so beautiful I almost cant’t eat it!! Actually thats a complete lie, of course I can eat it because its so BLOODY tasty. This healthy almond tart is paleo, gluten free, refined sugar free and despite all of the healthiness tastes exactly like the real deal. No kidding around here, if you fed this to unsuspecting mouths I doubt they would know the difference. I love almonds, like, really love almonds. Roasted, blanched, raw, ground, flaked… whatever way it is, I am on board. They contain lots of healthy fats, fibre, protein, magnesium and vitamin E. They also can help lower blood sugar levels, reduced blood pressure, decrease cholesterol levels, minimise hunger and promote healthy weight loss. All things considered, almonds are as close to perfect as a food can get! 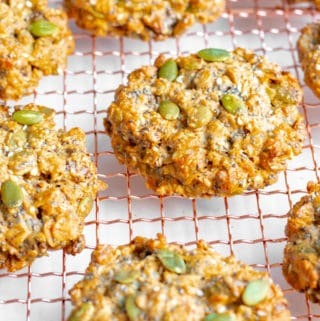 I realised I hadn’t made any almond based recipes here on Georgie Eats and thought goodness me, something needs to be done about this! I NEEDED to share my almond love with you all! A few months ago at my birthday dinner I treated myself to a almond raspberry tart for dessert, and although it was delicious it probably wasn’t worth the aftermath of destruction it caused my very sensitive stomach (tmi?). 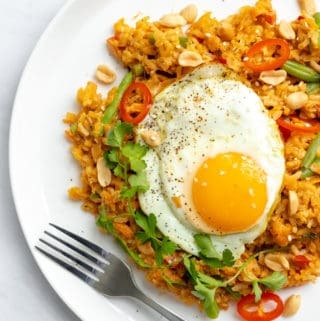 Since then, I have been meaning to create my own healthier version and after vigorously testing recipes I have come up with something brilliant, something magical, something you will NEVER believe is healthy! 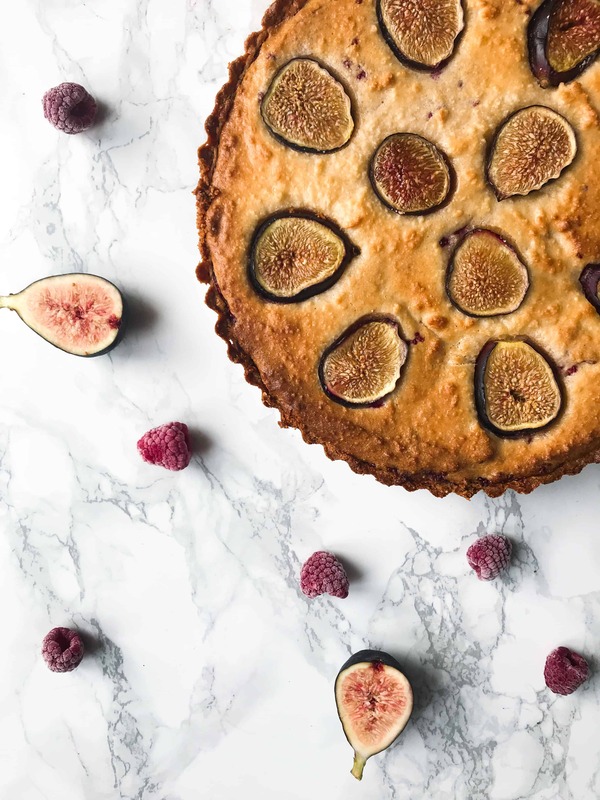 My healthy frangipane tart with raspberries and figs. 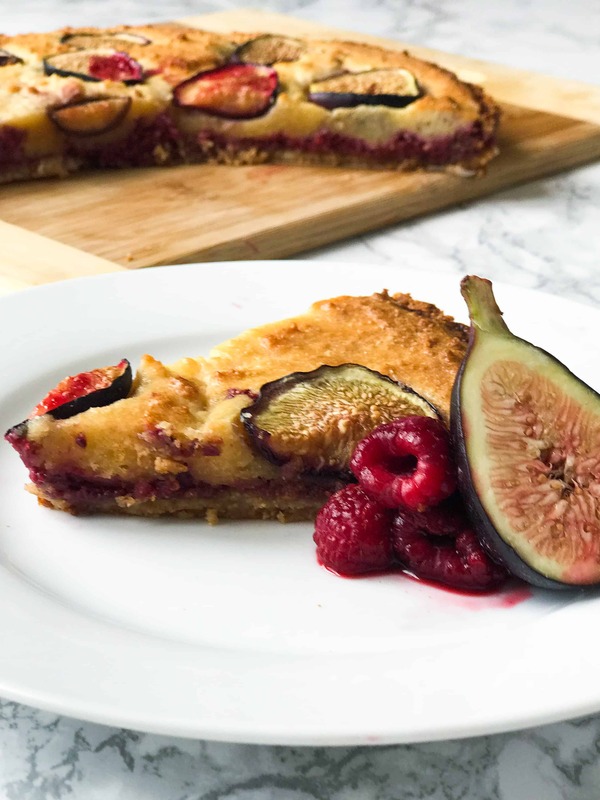 The tart consists of 3 components: Chia jam, an almond tart crust and frangipane. The ingredient list may look long, but actually it is just a few of the same ingredients repeated over, most of which you can find already in your store cupboard. Win! 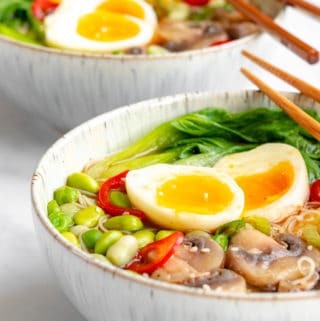 You may not believe me, but it is actually super easy to make too! Despite its show stopping appearance this healthy frangipane tart is pretty simple and actually doesn’t take a lot of skill. Its just some mixing and some arranging, easy-peasy. If you have never tried chia jam before – where have you been!!! Chia jam (in various flavours) is one of the staples I make regularly and keep in the fridge for whenever I might need it. Try it with toast, porridge, yogurt, fruit, PB (drool…), or even just with a spoon out of the jar. 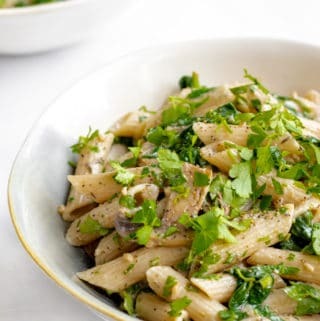 Make double the quantity you need for this recipe and you can do the same! I normally use frozen fruit for my jam as it is more economic to buy, but this recipe works just as well with fresh and if the fruit is in season you may not even need to add any sweetener! My healthy frangipane tart is perfect warmed up with a big dollop of greek yogurt and a few extra fresh raspberries on the side. Pair that with a big cup of steaming tea and you are in dessert heaven! Or breakfast…. Yes I will admit I even had this for breakfast, because who cares?! Im worth it. This beautiful healthy tart is paleo and refined sugar free. A delicious dinner party showstopper that packs all the taste with none of the guilt! Preheat the oven to 160°c fan / 180°c / 350°f. Line a 9'' removable base tart tin with baking parchment. Add the raspberries to a saucepan and cook over a medium heat for 5-10 minutes (depending on whether you used fresh or frozen). Whilst cooking, use the back of a fork to mash the raspberries into a puree to help release their juices. 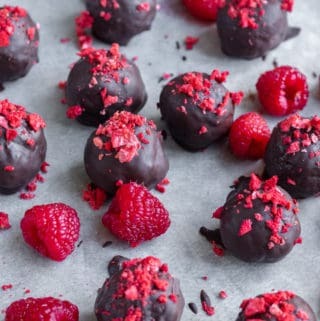 Once the raspberries have turned syrupy add the lemon, sweetener and chia seeds and continue to cook for an extra 2-3 minutes until you can feel the jam begin to thicken slightly. Remove from the heat and allow to cool. Combine the almonds, bicarbonate of soda, 2 tbsp of coconut oil and sweetener in a large bowl. Mix well. The mixture should resemble a soft dough. If you find your mixture is too dry add a little more coconut oil to the bowl and mix again. To allow the coconut oil to harden place the dough into the fridge for 15 minutes, once removed the dough should be able to hold its shape when moulded. Use your fingers to mould the dough into a thin layer evenly around the base and walls of the tart pan. Return to the fridge while you make the frangipane. Combine the ground almonds, eggs, egg yolks, sweetener and coconut oil into a large bowl and mix well. Try to work quickly here to avoid the frangipane setting up too much. Remove the tart base from the fridge and spread the chia jam in an even layer over the bottom. 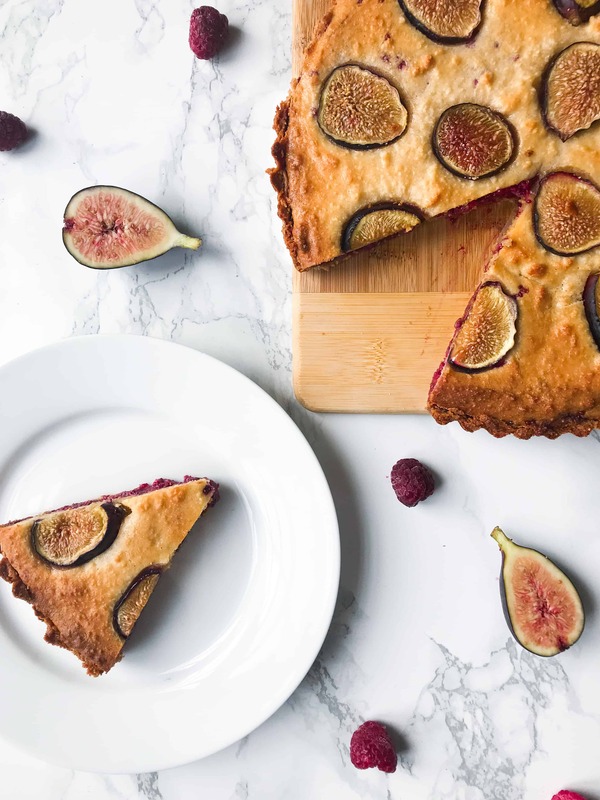 Spread the frangipane over the top of the jam before arranging the slices of fig (seeds facing out) into a pattern on the top of the tart. Bake in a preheated oven for 30 minutes until the tart is golden brown. Once baked remove from the oven and allow to cool completely before removing from the tin and serving. This tart is great served warm or cold. If you would prefer it warm I would recommend allowing the tart to cool completely before removing from the tin and reheating individual slices. Remember the almond crust is suppose to be very thin, and as long as you have no more than a 9'' tart tin the mixture will stretch! Feel welcome to substitute the fruit I have used here. Blackberry and plum would be another great combination! This looks gorgeous, I have recently been so into almond flavors, so rich and inviting. I love that you made a healthier version, bookmarking for sure! This is one magnificent tart! 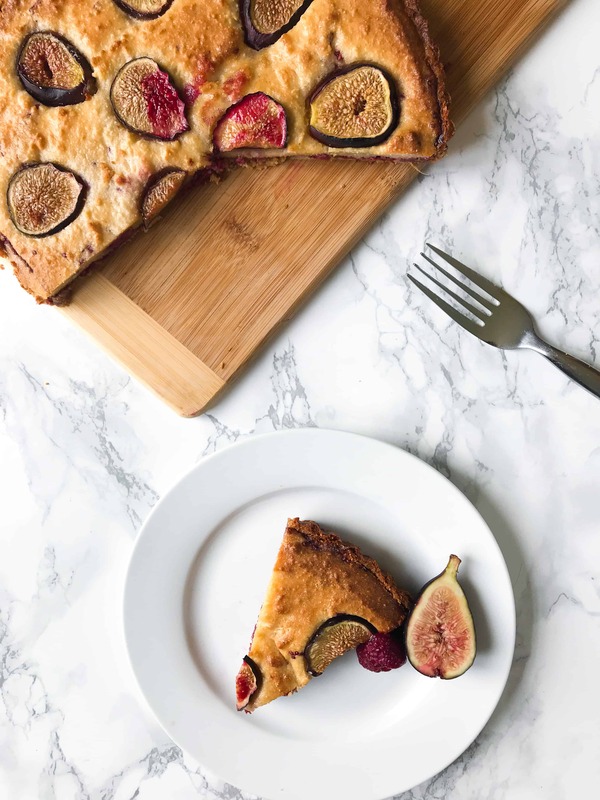 Fresh figs and frangipane….a heavenly combo! I’m so excited about this tart! I’ve developed a sensitive stomach over the past few years and this is packed with ingredients that I can eat with no problem! Love the chia jam and those figs! I love almonds! This tart looks beautiful! Definitely trying it soon! Lovely photos! Its a great combination! Give it a go! I absolutely love the flavour pairing of raspberries and figs! I can almost taste how delicious this is especially since almonds make everything tase 17389 times more delicious! I know right!! I love almonds sooooo much, I would put them in everything if I could!